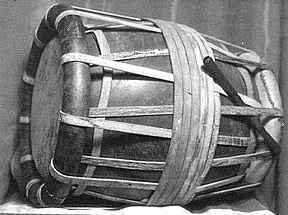 This is the instrument chosen to accompany Nadaswaram concerts. The skin on the right hand side is stretched very tight, so producing a very sharp sound. The player wears hard rings made of rice flour on his fingers to give the effect and volume. The Left hand is played with the stick seen here, gumaka being produced by pressing on the skin with the heel of the left hand. The whole effect is very dramatic: you cannot sleep when the Thavil is being played!